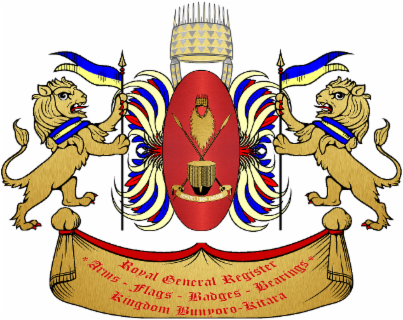 Royal General Register of All Arms and Bearings (RGR) - Bunyoro-Kitara Kingdom (Rep. Uganda) - The most powerful Kingdom in East Africa! His Majesty Rukirabasaija Agutamba Solomon Gafabusa Iguru I.
by The Grace of God, Omukama of The Kingdom of Bunyoro-Kitara, Ruler of Hoima, Masindi, Kibaale, Buliisa, Kiryandongo, Kagadi and Kakumiro, The Grandson of Kabalega, The Healer, The Orphan Protector, The Hater of Rebellion, The Lion of Bunyoro, The Hero of Bunyoro, The Hero of Kabalega, etc. etc. etc. The RGR, although a branch of the Royal household, is self-supporting. It has always been the case (and continues to be so) that the funds needed for the maintenance of the Palace, and the preservation of its records is derived from the fees payable upon grants of arms, and not from public funds. Each officer of arms conducts his own practice in heraldry and genealogy, and charges fees to undertake research. The heralds and pursuivants take it in turn, a week at a time, to be the officer on duty who deals with all letters, faxes, E-mails, and telephone calls addressed generally to the RGR. The officer in waiting, as he is termed, also sees those who make enquiries in person. He advises on whether he would be able to assist in a particular heraldic or genealogical problem, what research he would recommend and what fee would be payable for it. He will also arrange for the examination and recording in the College registers of pedigrees; and for the preparation under his supervision of a range of heraldic artwork. Any person who approaches the officer in waiting and employs him on some task becomes that herald's client. When an officer of arms is the agent for a grant of arms he is remunerated for his work on the case, and related expenses, by a payment out of the fees a petitioner pays to the RGR. RGR is guided by this Statute, the authorized laws and other directive certificates of HM the Omukama of the Kingdom Bunyoro-Kitara, and also the own Regulations. The RGR is administrative, executive, advisory and supreme judicial body its functions as four bureau [Bureau of Heraldry, Bureau of Award, Bureau of Genealogy and Bureau of ceremonies and Protocol] are to register any type of arms, flags, badges, names, title, seals, uniforms, award, decoration, vexillology, faleristics and other genealogical document also to keep a public register, to issue award and registration certificates, diploma, title and noble patent. Held a Noble Court - the Court of Honor and Council of RGR to advise HM the Omukama on heraldic matters and also a ceremonial-protocol procedure or service. Forms part of the Archives and Registers, which is under the authority of the Lord of Arms. Under HM Omukama law’s, everyone has the right to bear a coat of arms, as long as he doesn’t infringe on anyone else's rights in doing so. There is HM Omukama authority who can grant arms and other investiture as ruling head of the Kingdom Bunyoro-Kitara. Registration of arms is a necessary means of recording ownership, to protect arms against misuse or usurpation by others. The RGR has taken over the all records which showed above, new and previously registered by the any foreign state. We able to register the arms of official bodies in foreign countries and also, it is not confined to registering any arms for Banyoro fellow, it has registered a foreign residents' arms. Before the RGR could register any arms or other heraldic attributes, applications had to be confirm by the Lord of Arms after Council of RGR had examine it, but the supreme power of approval it right which belong to HM the Omukama. Any administrative body or private person can still refer their applications direct to the Council of RGR in case a vexed question. The College of Heraldry authorized by HM the Omukama to delete arms from the register, either on an applicant's request or, in the case of official, municipal or corporate arms, if the organization concerned no longer exists. Appeals against RGR decisions can be made to the Lord of Arms who will transfer it case to review by Council of RGR or Court of Honor if case depend to it office. The name of bearer arms available online. The illustrated blazons of approved applications for registration are published in the Heraldry Registers and available online through on special request. The RGR is itself armiger - its arms, adopted in 20xx. They are depicted on the seal on the bottom on each registration certificate and they were depicted in full colour at the top of the certificate with HM the Omukama and Lord of Arms full colour arms and their seal on the bottom.